The beachside’s future looks brighter, but can Daytona Beach fill 1,300 new hotel rooms? Published: Saturday, December 7, 2013 at 8:08 p.m.
Last Modified: Sunday, December 8, 2013 at 10:07 p.m.
DAYTONA BEACH — With new hotels poised to give the beachside what some observers call a long-overdue refresh, what could possibly go wrong? Well, there’s this: The law of supply and demand comes into play in a big way, and the prospect of new hotel rooms and meeting space holds both the promise of better times and concern about too much too soon. Major hotel renovation and construction projects — including the proposed Hard Rock Hotel and two-tower Protogroup Inc. hotel-and-condominium complex — are set to add about 1,310 hotel rooms to the area’s 12,000-room-strong inventory in 2015 and 2016. Though fresh rooms and new attractions that include the $400 million “Daytona Rising” renovation of Daytona International Speedway and the proposed One Daytona entertainment/retail development across the street will undoubtedly draw more overnight visitors in 2016, some hoteliers doubt those projects alone will be enough to keep the new hotels full of guests. And they worry about what will happen to their properties — in terms of occupancy and room-rental rates — if the new hotels stand only partly full come 2016. Tourism officials and hoteliers say the key to keeping the new hotels filled is to aggressively market them to lure vacation bookings and secure group business long before the properties’ ribbon-cuttings. The Daytona Beach area tourism industry has been growing. Hotels, vacation rental properties and campgrounds in the region generated $5.9 million in bed-tax revenues in fiscal year 2013, which ran from Oct. 1 to Sept. 30. That’s about 5 percent more than fiscal 2012, when the county collected around $5.6 million. Other measurements indicate growth, as well. Average occupancy at Daytona Beach area hotels rose to 56 percent in 2012 — up from 53 percent the year before and in line with the area’s 20-year trend — and average room rental rates increased by $6.45 over that period to $105.28 in 2012. 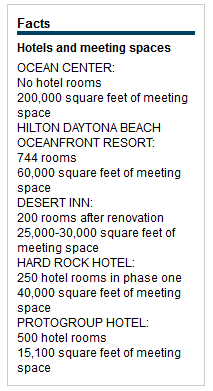 To be sure, operators of the incoming hotels will promote their products — and, by extension, Daytona Beach — vigorously. But, industry watchers say more is needed, and growth needs to ramp up by 2016 to prevent the new hotels from doing little more than competing for customers who were going to visit the area anyway. “If we’re not scared about 2016, we need to be really scared,” said David Rijos, general manager of The Shores Resort & Spa in Daytona Beach Shores, at a meeting of the Volusia County Tourist Development Council in October. Rijos serves on the council, which advises the Volusia County Council on tourism issues. Adding 1,310 hotel rooms — nearly 11 percent of what’s already available — in one year has all the makings of an overbuilt market, said Bob Sonnenblick, chairman of Los Angeles-based real estate finance and development company Sonnenblick Development. “That’s a huge number for a market like Daytona — a huge red flag,” he said, adding that a growth rate of 1 to 2 percent per year is normal. “You will see room rates drop by 30 percent overnight, and occupancy will drop (significantly)” as demand struggles to keep up with the surge of new rooms, he said. Local industry watchers are planning for the crush of new rooms. The Ocean Center, the Volusia County-run beachside convention center in Daytona Beach, should figure prominently in bringing more people to the area, Rijos said. In 2009, the convention center completed an $82 million renovation and expansion. Recently, it played host to a series of large events that brought thousands of visitors to the area. 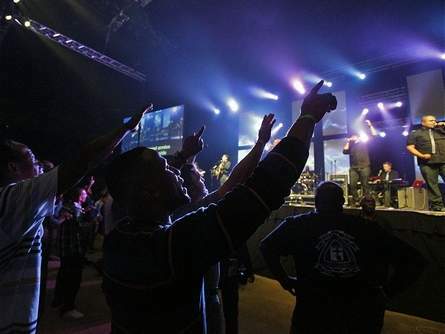 Those included the Promise Keepers Christian men’s conference in October, which brought more than 4,000 people to the area, and Living Proof Live with evangelist Beth Moore, a Christian seminar that brought more than 8,000 visitors to Daytona Beach in November. “The Ocean Center isn’t a silver bullet, but it certainly is our best bullet,” Rijos told the tourist development council. Keeping the Ocean Center booked with events that fill hundreds of hotel rooms will require an effort that improves upon current bookings. The Ocean Center and Halifax Area Advertising Authority — the taxpayer-funded organizations tasked with bringing conventions to the area — spent the better part of the last year and a half at odds as to how to accomplish that, with parties from both sides accusing the other side of undermining their efforts. The two organizations recently defined their roles, with the Ocean Center’s sales team focusing exclusively on booking that building and the ad authority working to bring conference business to area hotels and meeting spaces, such as Daytona International Speedway. Additionally, the ad authority’s board in August voted to divert $400,000 of its budget to bring business to the Ocean Center. The convention facility used the money to hire new salespeople and establish an incentive fund to attract new events. The changes should prevent the Ocean Center and ad authority from stepping on each others’ toes, said Don Poor, the convention center’s director. According to Ocean Center records, the convention center hosted 18 events estimated to use three or more hotels and at least 1,000 hotel rooms on their peak nights in the 2013 fiscal year, which ended Sept. 30. That’s a drop from fiscal 2012, when it hosted 21 such events, and slightly higher than fiscal 2007 — before the renovation — when it hosted 17 major events. The Ocean Center has 23 large events booked for fiscal 2014, according to the report. The Ocean Center isn’t the only convention space on the beach. Hotels with meeting areas dot State Road A1A, as well. In fact, the 200,000-square-foot Ocean Center stands across the street from the Hilton Daytona Beach Oceanfront resort, which itself packs 60,000 square feet of meeting space. And the supply is only going to grow. The Hard Rock Hotel is expected to add 40,000 square feet of meeting space when it opens, while the Protogroup development will bring in another 15,100. Meanwhile, just up S.R. A1A from the Protogroup site, the recently sold Desert Inn will open with 25,000 to 30,000 feet of meeting space after the hotel’s new owners finish renovating the property in late-2015. Because they’re smaller, hotels don’t have the means to play host to the kind of large events the Ocean Center does. However, business from meetings at the hotels and from sporting and other events held in the area are an important source of revenue, especially during the slow winter tourism months, said Jeffrey Hentz, executive director of the Halifax Area Advertising Authority. Many groups book their trips and meetings two to five years out, which means the clock is ticking for the new hotels. If the new hotels don’t have booked group business when they open, they’ll have to fill the rest of their rooms somehow. And that could be very bad for the destination, Hentz said. To prevent this, the new hotels need to start booking as soon as possible. “They have to start the day they start moving dirt,” Hentz said, adding their sales teams also need to accompany ad authority staff to trade shows and other events. That’s the plan, said Ken Berthiaume, regional director of sales for Summit Hospitality Group, the company that bought the Desert Inn. “Once we break ground, I’ll start pre-selling,” he said. Summit intends to close the Desert Inn in late-2014 for renovations. The company hopes to re-open the hotel under a major hotel brand in 2015. Protogroup plans to begin marketing its hotel rooms about a year before its 2016 opening, said attorney Rob Merrell, who represents the company locally. Though the new hotels could cause growing pains, observers say they are nonetheless needed to make Daytona Beach competitive with other destinations. For years, the area has been losing tourists to counties like St. Johns and Seminole in large part because Daytona Beach’s selection of hotels is old and in need of major updates, said Mark Soskin, an economist with the University of Central Florida. Henry Wolfond, chairman of Bayshore Capital, the Toronto company that is developing the Hard Rock, agrees that newer hotels are needed. When they’re built, they’ll work in tandem with the renovated Speedway and its restaurants and shops to encourage vacationers to take a second look at Daytona Beach, he said. Also, industry watchers say the new branded properties will help sell the destination to professional meeting planners and vacationers looking to earn customer loyalty points with the hotel companies. “The more flagged hotels we open up, the greater level of success we’re going to have in raising our rate structures and bringing in more customers that are loyal to those brands,” Hentz said. Libby Gallant, general manager of Perry’s Ocean Edge Resort in Daytona Beach Shores, said she shares concerns about the incoming supply, but wouldn’t stop it from happening even if she could.